Weight is an important factor that is instrumental to make you lead a fit and healthy lifestyle. While majority of individuals are struggling in losing weight, there are a selected group of men and women who are struggling to put on some weight. Just as being overweight is considered to be unhealthy, being too skinny is also a sign of not so good health. And body weight also affects the overall look and personality of an individual. Maintaining proper body weight is seriously important, and if you are too skinny or underweight and wondering about how to gain weight in a healthy way, then here’s the post worth checking. 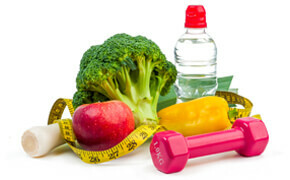 Today I am going to discuss about the best diet to gain weight fast and naturally. Every individual must have body weight that is in perfect balance with age, height and gender. For most individuals, it is easy to gain weight but if you suffer from certain health problems or you eat less and that too untimely and unhealthy foods, then trust me, its going to affect your health and body weight badly. Your body needs proper nutrients for it to work on optimal level, and for that to happen, your diet must include a variety of healthy and nutritious foods. I have a close friend of mine who is comparatively very thin and she doesn’t feel good about it. While most of us struggle to keep our weight under control, she always prays to gain a few pounds. Because mostly, the individuals who are under weight have to face public humiliation and embarrassment, which if left uncontrolled may lead to severe stress and depression. But my friend has put on some weight by simply following a diet to gain weight as advised by a dietician. The point I am trying to make is very simple. Gaining weight is equally difficult like losing weight, but you can gain weight by following a simple diet to gain weight. If you cannot help yourself, no one else will be able to help you. Whether you are struggling in gaining weight or losing, you have to eat right. The food we eat on daily basis can have tremendous affect on your body weight. So be determined, consult a doctor or a dietician and you will be on your way to gain or lose weight. But today, we are not talking about weight loss and we will stay focused on how to gain weight by following the best diet to gain weight. Eating right and following a diet to gain weight is probably the best way to put on some weight in a healthy way. Many take the help of medicines or pills or use the steroid injections to gain mass but these are all unhealthy and may have consequences in the long run. So, it is always safer to gain weight naturally by eating healthy and nutritious diet. Since food is very important and exerts a direct impact on us, the best way is the superfoods that you should include in your diet to gain weight but in a healthy manner. Every individual have different body type and our day to day activities varies a lot and hence a proper diet to gain weight can be advised by a dietician. But there are many foods that are considered to be healthy, eating these foods and can help you gain weight fast and naturally. Eating a balanced and healthy diet is the secret to healthy living. If you are suffering from being underweight, then you must add certain foods in your diet to gain weight naturally and in a healthy way. Here’s the list of 12 super foods that’ll help you gain weight fast and in a healthy way. If you are not allergic to dairy products, then milk is probably the best foods that you should add to your diet to gain weight. Milk is considered as one of the healthiest superfoods that should be included in your diet to gain weight fast and naturally. In fact, since ages, milk is considered as the perfect muscle builder. Several studies have also considered it to be the best sports drink. It is the powerhouse of nutrients containing almost all of the essential vitamins, proteins and other essentials nutrients in it. It is loaded with carbs, proteins and fats. It also contains good amounts of calcium as well as several other minerals and vitamins in it. Milk is especially beneficial for those who want to build muscles as it contains both the whey proteins and the casein that are much needed for muscle building. Research has shown that it is really beneficial for muscle building especially when it is combined with weight lifting. Hence, if you are training to build muscles or desperately want to gain weight, then do drink 1-2 glasses of milk daily before or after workout. Adding milk to your diet to gain weight will help you get it right naturally. This will not just make you gain some weight but will also keep you energetic and strong. Red meats are the perfect muscle builders that you can help you to gain weight fast and naturally. The primary reason of red meat being a good food to gain weight is the presence of leucine in many red meats for example steak which as per studies, is the main amino acid that helps your body build muscle protein synthesis and thereby add new muscle tissue. In addition to that, the red meats are also rich in dietary creatine which modern science easily bet to be the best muscle building food supplement. In addition, the red meat contains more number of calories and fat in comparison to the leaner meats which will help you gain some weight. In one of the studies, 100 elderly women were made to eat 170 grams of red meat along with performing resistance training sessions for 6 weeks (6 days per week) and the result showed that they experienced an increase in the amount of IGF-1, the muscle building hormone as well as an 18% increase in overall strength. Although eating red meat is considered to be good to gain weight, one should not over eat red meats, especially when you are not leading an active life and work out regularly. One of the healthiest ways to gain weight is by making nuts and nut butters a part of your diet to gain weight. Research has shown that even a handful of almonds contain proteins of over 7 grams and around 18 grams of other healthy fats that is enough to help you gain weight easily. Since nuts are so rich in calories, even two handfuls of them will be of great help in gaining weight. You can also add nut butters in your diet by adding them to various yogurts, smoothies, or in any form. But, make sure that you go for the 100% nut butters that have 2-3 ingredients in it. But avoid nut butters that contain added sugar or extra oils. Amidst all forms of chocolate, dark chocolate is considered to be the healthiest one. If you eat dark chocolate of high quality, then your body will gain all the necessary antioxidants needed for healthy weight gain. It has a high calorie density with 100-gram dark chocolate bar containing around 600 calories. Dark chocolate also contains micronutrients and other health-promoting nutrients like magnesium, fiber etc. So, if you want to gain weight, you should start eating dark chocolate having 70% or more cocoa content. It’s a nice food supplement worth adding in your diet to gain weight. Just like the red meats, salmons and the other oily fishes are the perfect source of proteins and other healthy fats, one of them being the very essential omega 3 fatty acids. Several studies have also shown the benefits of omega 3 fats in fighting several health issues. Now, if your body is provided with these healthy fats, it will automatically grow strong and you will be able to gain weight in a healthy way. As per research, just one 6-ounce that is around 170 grams of salmon gives your body 350 calories and 4 grams of fatty acids. You also get around 34 grams of good quality protein which will help you build muscles. Hence, make sure you include adequate amount of salmon and other oily fishes in your diet to gain the maximum benefits. While juicy fresh fruits can help you shed pounds, the dried fruits are the perfect calorie snack that will help you gain a few healthy kilos. They contain several antioxidants and micronutrients that aid in gaining weight. Moreover, they taste good, so it won’t be a problem to eat dried fruits. There is a general misconception where many think that the dried fruits lose the nutrients when they are dried but in reality, they are rich in fiber and most of the minerals and vitamins remain intact in them. To get the benefits, you can mix them with nuts and yogurts and then eat or mix them with several shakes before consuming. This will help you enjoy both the taste as well the weight gain benefits. Unlike the other whole fruits that you get in the market, avocados are calorie dense which you can easily include in your diet to gain weight. Avocados are a great source of healthy fat and that’s why it helps gain weight fast. As per research, one large avocado provides your body with 322 calories, 17 grams fiber and around 29 grams of fat. They also contain high amounts of vitamins, minerals and other healthy plant compounds that also aids in gaining weight. To gain both the taste and the weight gain benefits, you may add the avocados in the sandwiches, omelets and many other foods. Cheese is one of the superfoods that you should include in your diet to gain weight. In fact, it is a staple food for many since ages. Cheese is rich in fats and calories and research shows that if you eat it in adequate quantity, it will also provide your body with enough proteins. Basically, it has every ingredient that will help you gain weight naturally. So, if you want to gain weight then you must surely add the tasty cheese in your diet to weight gain. Full fat yogurt is probably the most convenient and healthy snack and with a perfect balance of carbs, protein and fats, it is one of the best superfoods that you should include in your diet to gain weight. The plain yogurt is low in fat and helps in weight loss but the full fat yogurt can help you to gain weight fast. You can mix the full fat yogurt with fresh or dried fruits and then add other ingredients like nuts, honey, granola, seeds, chocolate flakes in it to make it healthier and tastier. You can add yogurt to any smoothie which will increase the protein content of it as well as make it more creamy and thick. Yogurt can also be added to mixed berries and granola in layers to make it a healthy and tasty breakfast or snack. You can also eat it by mixing it with 100% cocoa powder, peanut butter, and any sweetener of your choice. To add extra protein, you may add a scoop of whey to it as well. Besides chocolate, I guess this is one of the tastiest ways to gain weight fast and naturally. Ice cream tastes like heaven and satisfies your soul. Ice creams are rich in fats, calcium, carbohydrates, phosphorous, potassium, Vitamin A, all of which is really important for fast and natural weight gain. A single cup of ice cream contains around 207 calories and the various flavors and toppings make it ideal for weight gain in a tasty manner. If ice cream is consumed frequently, it can make you gain weight in no time. But, please do not overconsume it especially those individuals who are more prone to cold and cough. Rice is another super food that you can include in your diet to gain weight fast and naturally. Research has shown that even just a cup of cooked rice of about 165 grams contains around 43 grams of carbs, 190 calories and adequate fat which is like the winning combination for gaining weight. Because of the density of the calories, you will get the benefit even with just one serving that is good for people who got poor appetite or gets full quite fast. However, it is better to measure the quantity you are consuming and avoid overeating. This is mainly due to the presence of phytic acid and arsenic in it which are harmful for your general wellbeing. Phytic acid may reduce your body’s ability to absorb two important nutrients which are zinc and iron whereas arsenic can lead to mental toxicity. There are very few who does not like eggs and now you can use it to gain some healthy weight as well. Eggs are by far one of the healthiest muscle building foods due to the presence of healthy fats and high-quality proteins in them. Whole eggs are good for your heart as per modern science and the previous conception of it being harmful for heart is all a myth. In fact, most of the healthy nutrients are contained in the yolk which is good for your body. If you are not intolerant to eggs, then you can easily eat 2-3 of them daily. Many athletes and body builders eat 5-6 eggs every day. Eating right and proper exercise will surely help you gain weight. But, here are few more tips, which if you follow will enable you to gain weight fast and easily. Avoid drinking water just before eating your meals. This not just affects your digestive process but also makes your stomach full from before which does not allow you to eat the amount of food that is needed for effective weight gain. Eat your foods quite often. Squeeze an additional snack or meal whenever you feel like. Whenever you sit to eat, use larger plates as that will enable you to eat more. Having small plates will automatically lessen the food quantity. Whenever you are drinking your morning or evening coffee, just add a bit of cream to it. This will make the coffee tastier as well as enable you to gain weight naturally. Get adequate sleep as that helps in the muscle building process. Moreover, if you are into weight lifting or muscle building, your body needs enough rest to stay strong. Smoking is not good for your health in general more so if you are planning to gain weight. This is because smoking adds to unhealthy weight loss. I hope that so far you have noted down the names of all the superfoods that you must include in your diet to gain weight. Well, eating proper nutrients and calorie dense foods are by far the best way to gain weight in a healthy manner. But, if you keep eating too much, then a day will come when these extra calories will turn into fats which may lead to weight gain issues or other health problems. So, to keep yourself fit and gain healthy weight, you also need to exercise regularly. If you exercise every day, it will keep you strong and if you want to build muscles, then do some weight lifting as that will utilize the additional calories to build muscles instead of turning them into fat. Many of us who suffer from overweight issues may assume that gaining a few kgs of extra weight is quite easy in comparison to losing a few kgs of weight. Well, that may be partially correct given the present condition where obesity is increasing in an alarming rate. But individual who have suffered from underweight issues know that it is sometimes hard to overcome underweight issues more so if you are suffering from any health concern. 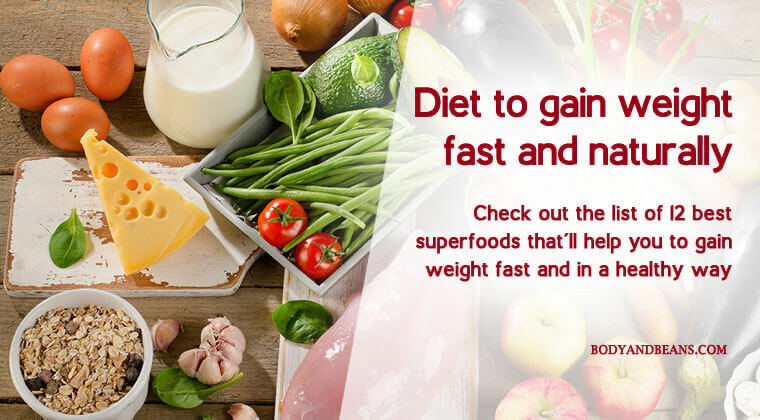 While it’s always better to consult a dietician or a physician to gain or lose weight, there are many healthy foods that can help you gain weight fast and in a healthy manner. There are many ways to gain weight like by using medicines, pills etc. but continuously tasking such supplements is not a good practice. Hence it is better to adopt natural ways to gain weight. We have already discussed about 12 of the best super foods that can be added to your diet to gain weight. Eating these super foods and practicing other hacks that we have discussed above will help you gain weight fast and naturally. All these food items are healthy and are rich in calories which will definitely help you put on some weight. However, you know that nothing in excess is good. So, no matter how thin you are, avoid overeating because that may have a negative impact on your health. Stick to a perfect quantity which is enough for weight gain and maintain that on a regular basis. Overeating may also take a toll on the other organs of your body and so it is better to eat a healthy and balanced diet with the variety of calorie dense foods included in the diet list. Besides eating right amounts of proteins, fats, carbohydrates, vitamins, calcium, etc. you must not forget to exercise regularly. Exercise is not meant only for losing weight but there are specific exercise that helps in building strong bones and muscles. Go for weight lifting as well to build a good physique. And, since your body is working so much, give it proper sleep that is also necessary for muscle building and recharging your batteries in general. Do you eat any of these super foods to gain weight fast and in a healthy way? What else exist in your diet to gain weight? Share your experiences by commenting below. Until then, stay healthy, stay happy and do not forget to follow, like and share my posts on regular basis. Also, feel free to share your valuable feedbacks on how we are adding value.